Graham was studying at the Art Students' League at the time. He introduced Gorky to Focillon's Life Forms in Art, which Graham translated for Gorky. Focillion argued that there were certain forms or types that recurred through history throughout different cultures. Summer 1928: The Pollocks move to Los Angeles. Jackson Pollock, his mother Stella and his brothers Sande and Marvin Jay moved to Los Angeles. Jackson's brother Frank moved to New York. Jackson's oldest brother, Charles, had moved to New York in 1926. (PP316) In Los Angeles the Pollocks lived at 1196 39th Avenue. In New York Charles studied at the Art Students League and Frank was a part-time student at Columbia University. 1928 - 29: Franz Kline's sophomore year at Lehighton HIgh School in Pennsylvania. September 11, 1928: Jackson Pollock enrolls at the Manual Arts High School in Los Angeles. Jackson's friends at the school included Philip Guston and Manuel Tolegian. Tolegian was born in Fresno, California in 1911 but had Armenian roots. c. November 1928: Mark Rothko shows at the Opportunity Gallery. It was the first group show that Rothko participated in. (RO91) Adolph Gottlieb and Milton Avery also showed at the gallery (see 1929 below) and the three became friends. Late 1928: The John Reed Club is founded. During 1932-33, Philip Guston and Reuben Kadish painted murals for the Los Angeles branch of the John Reed Club. The murals were destroyed on February 12, 1933 when the premises were raided by the Los Angeles Police. Late 1920s: Willem de Kooning falls in love with a tightrope walker. January 1929: Adolph Gottlieb exhibits at the Opportunity Gallery. Five paintings by Gottlieb were included in a group show. 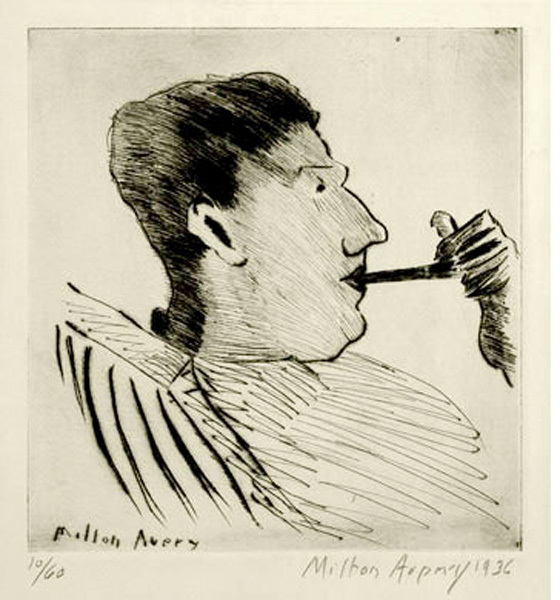 It was at the opening of the show that he met Milton Avery. It was around this time that Gottlieb also befriended Mark Rothko. 1929: Arshile Gorky meets Ruth French. Despite Gorky's sexual naivety, he and Sirun became lovers and she moved in with him. 1929 - 1930: Barnett Newman attends the Art Students League again. 1929: The term, "Abstract Expressionism," is first used in the United States. Art critic Robert M. Coates claimed that he originated the term Abstract Expressionism in a review of a Hans Hofmann exhibition. "Hoffman," wrote Coates in an article published in the March 30, 1946 issue of the New Yorker magazine, "is certainly one of the most uncompromising representatives of what some people call the spatter-and-daub school and I, more politely, have christened abstract Expressionism." During the 1930s, the art critic Edward Alden Jewell, had referred to work by the abstract artist members of The Ten as "American expressionists" when reviewing their December 1936 show at the Montross Gallery. The "recent article" referred to by Rothko was Elaine de Kooning's "Two Americans in Action: Franz Kline & Mark Rothko," that appeared in the Art News Annual XXVII, 1958, 86-97, 174-179. Barnett Newman also expressed doubts about Expressionism. Previously the term "Expressionism" was used mostly in reference to certain European artists of the early twentieth century. March 1929: Jackson Pollock and Philip Guston are suspended from Manual Arts over The Journal of Liberty. April 29, 1929: Willem de Kooning befriends John Graham. 1929: Arshile Gorky meets Stuart Davis. Davis would often join Gorky, Misha Reznikoff and John Graham at Ticino's on Thompson Street. 1929: Mark Rothko teaches at the Center Academy. July 1929: Jackson Pollock has a fist fight with his father. 1929: Arshile Gorky takes a studio at 36 Union Square. As with de Kooning, Gorky kept his studio "scrupulously clean" according to his friend, Saul Schary. 1929 - 1930: Franz Kline's junior year at Lehighton High School in Pennsylvania. 1929 - 1932: Robert Motherwell attends Moran Preparatory School in Atascadero, California. September 1929: Jackson Pollock returns to Manual Arts HIgh School. 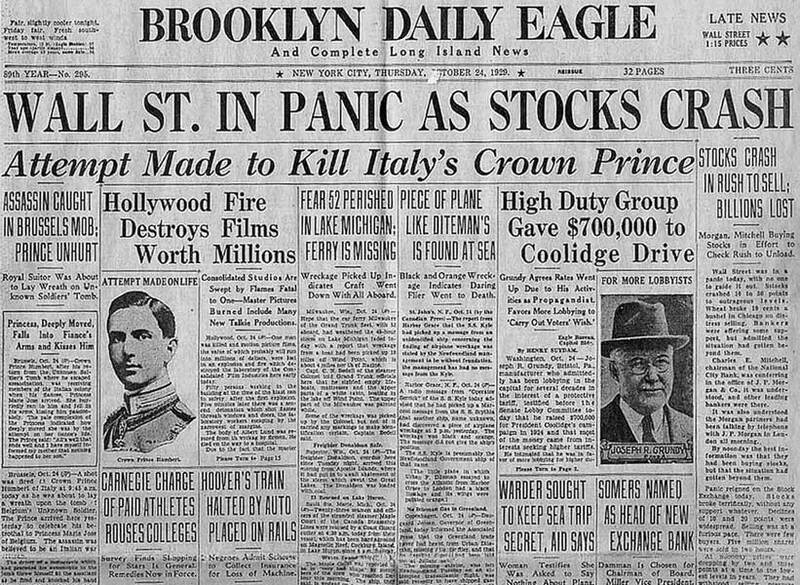 October 24, 1929: The American stock market crashes. The "roaring twenties" were over. 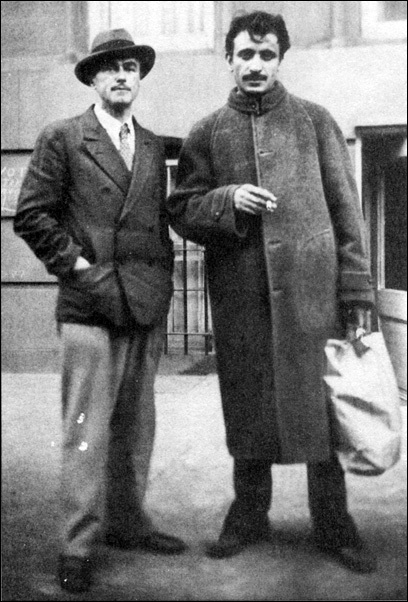 c. Late 1929/Early 1930s: Willem de Kooning befriends Arshile Gorky. According to de Kooning biographers, Mark Stevens and Annalyn Swan, Gorky and de Kooning met a second time near Gorky's studio at 36 Union Square and de Kooning asked Gorky if he could visit him sometime in his studio. "Why not now?" asked Gorky. "Gorky and de Kooning are said to have met at the opening of John Graham's 1929 exhibition at the Valentine Dudensing Gallery. De Kooning had a better story. He said he had been wanting to get to know Gorky, but Gorky kept rebuffing his overtures. First they met at a party at Mischa Reznikoff's apartment. Gorky was talking to Graham when he noticed a handsome blue-eyed man of medium height. He approached him and said, 'You talk like a truck driver.' De Kooning answered, 'Well, be careful, otherwise I'll take on the ways of a truck driver and beat you up.' Gorky said, 'That's silly. I'm much taller than you are.' Thrusting his long arms with enormous hands in front of de Kooning's face, he warned, 'Look how long my arms are!' For the moment, de Kooning didn't want to have anything to do with this belligerent giant. The next time de Kooning encountered Gorky at a party, he quickly thumbed through an art magazine to find a reproduction that might serve as a conversation opener. He took the magazine over to Gorky, but Gorky turned him away with a dismissive gesture. At yet another artists' gathering de Kooning tried to join a conversation between Gorky and Stuart Davis. He told them that he had just discovered a wonderful painter at the Metropolitan Museum - Nicholas Poussin. Pretending to have never heard of Poussin Gorky and Davis played de Kooning along. Finally Davis, who talked out of the corner of his mouth like a gangster in a Hollywood movie, said, 'Well, I don't know. Sounds like a foreigner to me,' and to his chagrin de Kooning realized that Poussin was someone that the two had known about for years. November 7, 1929: The Museum of Modern Art opens in New York. Twenty-seven year old Alfred Barr was the director of the museum when it opened. 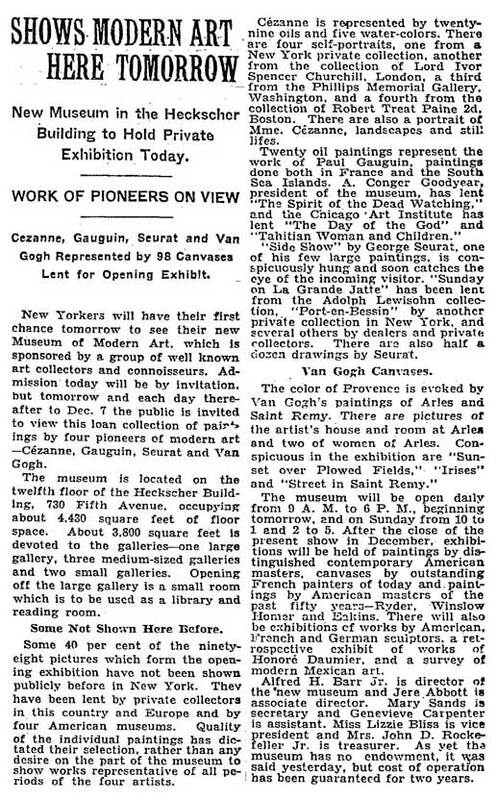 The inaugural (loan) exhibition, "Cézanne, Gauguin, Seurat and van Gogh" (November 7 - December 7, 1929) attracted 47,293 visitors. End 1929/Early 1930: Willem de Kooning works as window dresser for a chain of NY shoe stores. The window displays of the A.S. Beck shoe stores were done at the firm's headquarters at 139 Duane Street. While at A.S. Beck de Kooning befriended another employee, Robert Jonas, who became a regular visitor to the home of de Kooning and his live-in girlfriend Virginia "Nini" Diaz. Jonas later recalled that de Kooning "came with a furious thrust towards being modern." Among the "modern" movements mentioned by de Kooning were De Branding and the De Stijl group as well as Frank Lloyd Wright. Another favourite topic of conversation was politics. Nini Diaz later recalled that "They never stopped talking, him and Jonas... All about Communism. And when they were finished, they just started in again. "(DK83/84) At the time, Jonas was a Communist who would later be a key organizer of the Artists Union.